December is coming to an end and with that we must face a New Year. 2013 almost did not happen-according to the Mayan calendar or those that predicted the end of the world in previous years. Personally, I never believed any of the dates or calendars. I won't judge, though if you did. We are each entitled to our own belief. I will have to share a funny story with these events in mind. On December 20, my family and I were enjoying our 12 Days of Christmas celebration (we each were given a white shirt and asked to decorate it). Having just finished and restoring the caps to the markers, the lights began to flicker. We live in a very wooded community and so this is not unusual. We roll our eyes and jokingly say, "not again?". This time, it was different. The lights flickered off and on at least 10 times-fading in an out-not the usual on and then off again motion of previous outages. Eventually they were out. I mean OUT OUT-for 6 hours OUT! We looked outside and the darkness was so black. Usually when we lose power you can see a glow in the distant and we know that the big city is still bright and merry. Not this time. It was silent, dark and very cold. We decided to light our candelabras and sit around the table. I have had these candles since we were married. They are silver and have been used for every Christmas and important holiday. They are showing their age and yet I cannot depart from them. As I watched the wax roll down the side of each candle, heard the laughter of my children and saw their smiles--I knew that I was being given a very special memory to archive for future story telling opportunities. Little did I know that our night would get even better. We thought it strange that we did not hear any fire trucks or sirens. When the power has gone out before we hear these in the distant and this will sometimes give us a clue as to why we may have lost power- a fire, a car accident or something else. What we did hear was a hum. A low hum coming from outside. Drake walked to the front door, opened to find a green glow over in the direction of the high school. We all quickly ran to the windows and peered outside. For the first time, I thought the Mayan's might have been right. I know it's funny but when you see something that you have only seen in movies before your eyes, your mind does strange things. I really said this, "Cory, are those aliens?" Silly, huh? For a few seconds I thought the Mayans had predicted the end of the world and it was going to be at the hand of little green men. It made me anxious, Isabella was in tears and the big kids thought they were in for the ride of their lives. Dad was just cool and sat there working on his shirt, by candlelight and taking in the conversation at the table. We mentioned more than our fair share of Zombie and Apocalypse type jokes through out the rest of the night. To end the night we brought out our Tarot cards and had some fun. This is something that we enjoy doing as a family. I know that many don't understand the cards, don't believe in them or may even think they are evil. To us, they have been a fun way to see our lives, think about the possibilities of our future, help understand the past and refine things in our present day. It's not for everyone, but our family, on this night, drew comfort from being together and doing something that sparked great conversation and a memory that none of us will soon forget. I awoke the next day thinking to myself, that I had just partook of the best day of my life for the year 2012. My Christmas gift came a few days early and I can still feel the gratitude I will forever hold to; that for a few hours, the lights went out, technology turned off, the candles were lit and we enjoyed each other uninterrupted. With the memories of 2012 still close to our hearts and our future before us, my goal to simplifying my life is one that I will take with me into 2013. This recipe is an easy one that I hope will lighten your load on a busy night. I am sharing with you a biscuit idea that I first tried for my family a few years back. I am pretty sure I found the recipe on the back of a Grands biscuit tube. You can use tuna or chicken to make the salad. My family prefers chicken. If you need to use gluten free biscuits, HERE is an easy recipe that I make. They will need to be precooked as the recipe below suggest. Preheat oven according to directions on biscuit can. Bake the biscuits according to those directions. In a medium sized bowl, combine the remaining ingredients. After the biscuits have cooled for a few minutes, cut in half. 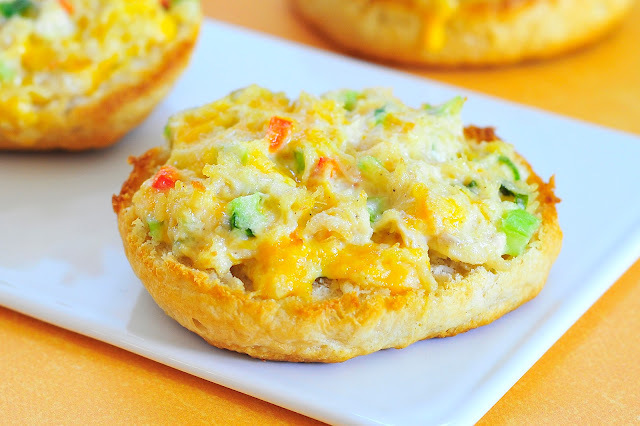 Put a small scoop of chicken salad on top of each biscuit halve with a bit more cheese. Place each halve on a cookie sheet and broil until cheese has melted. Well, at least you had a very interesting night. :) The melts sound delicious. Simple and tasty. Very nice. I like this post.Keep sharing !